Happy Spring Day to you all! I have no card to share today because I've been spending all my free time in the garden. Because I want my blog to be more than just about cards and about all things of creative interest to me, I thought I would post some early spring pictures of my garden. The first picture is of my son and his dog Aspen enjoying a beautiful spring day in my garden. The second picture is of my son in the garden with our house in the background. My house sits high on a hill, and although there are a few garden beds around the entrance to the house, the majority of the gardens are on hillsides or well below the house. I have great legs by the way. Walking up and down the hills everyday is all the exercise I need! LOL! I always laugh when people come to visit my gardens and they are out of breath from just one trek up the hill. They usually comment 'No wonder you have such great legs!'. 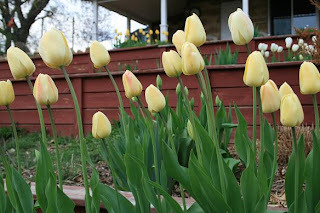 Here are some early blooming tulips in the retaining walls by the back of my house. 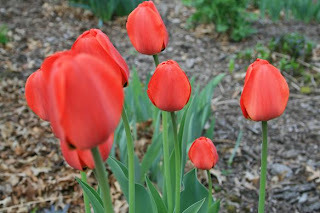 Here are some pink and orange/red tulips. 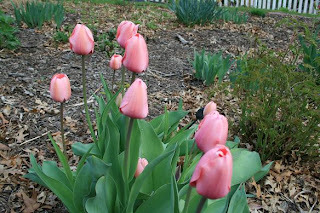 Most of my tulips aren't in bloom yet, or full bloom yet. There will be more of these beauties to come later. 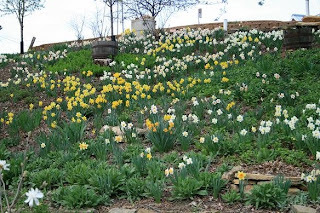 Here is a picture of my 'hillside of daffodils' looking up the hill toward the house. 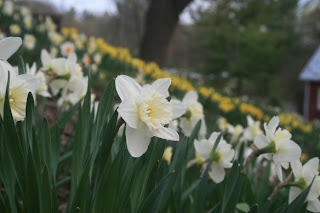 The picture in my header is looking down the hill at the daffodils. 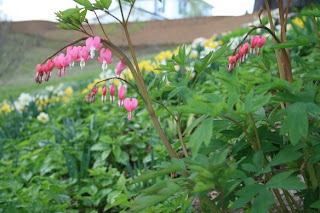 This is a close up of one of the many, many, many bleeding hearts on my property. I have both the pink bleeding heart and the white bleeding heart. 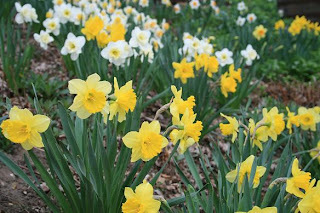 And the last three photographs are close ups of the many different varieties of daffodils I have. I have lost count of all the different varieties, but I sure have a ton! 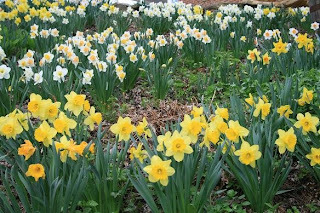 WOW you have a lot of daffodils! Such nice photos of your pretty gardens. Our daffodils only just bloomed within the last day. I'm so glad you share your beautiful gardens with all of us!!! I think that was one of the things that kept drawing me back to you blog ... keep up the good work and you'll have the legs of a 20 year old when you're 80 instead of the other way around... LOL! Oh yea ... forgot to mention what a cutie your son is! !